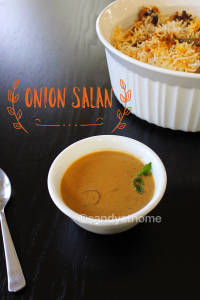 Onion salan is a thick and flavorful gravy that is exclusively served with biryani in restaurants. This salan aroma and taste is much different from other gravies as it uses peanuts, sesame seeds and coconut. It is simple to make and lip smacking recipe that makes biryani even more delicious. 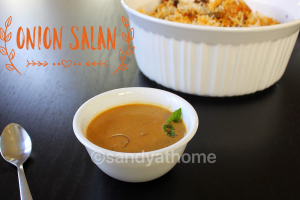 Sometime back i had posted similar recipe Baingan ka salan but i altered the recipe little bit and still the taste was similar and too good. 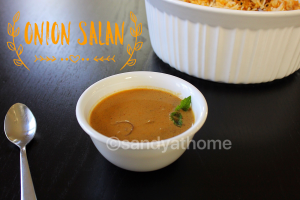 I like to serve this salan with dum biryani as it goes well with that. So lets get to the making! Soak tamarind in 1 cup water. Extract tamarind juice from it and keep it aside. Heat a pan/ kadai, add peanuts (without skin) and sesame seeds. Dry roast in medium flame until aromatic. Remove from heat. How in the same pan dry roast sesame seeds. When it splutters remove it from heat. Now add all the ingredients mentioned under to grind list except peanuts, sesame seeds and dried red chilli. Dry roast in medium flame until aromatic. Now add few drops of oil and roast dried red chilli. Now allow all the mixture to cool down. Ina blender add ginger chunk, garlic pod and roasted ingredients. Grind it into thick paste adding little water. Heat oil in a pan add thinly sliced onions and Saute well. Now add the ground mixture and mix well. Add required quantity of water to make the salan. ( I added 1 cup water Make sure the salan is thin in consistency as it will start thickening after cooling down.) Mix well and cook it in medium flame as the mixture kept spluttering all over. Now add chilli powder, coriander powder, turmeric powder and garam masala powder. Along with the dry powders add tamarind juice. Mix well and allow the mixture to boil well. When the raw smell of tamarind juice goes and when everything looks combined put off the flame and serve! Heat a pan/ kadai , add peanuts (without skin) and sesame seeds. Dry roast in medium flame until aromatic. Remove from heat. How in the same pan dry roast sesame seeds. When it splutters remove it from heat. Now add all the ingredients mentioned under to grind list except peanuts, sesame seeds and dried red chilli. Dry roast in medium flame until aromatic. Now add few drops of oil and roast dried red chilli. Now allow all the mixture to cool down. Ina blender add ginger chunk, garlic pod and roasted ingredients. Grind it into thick paste adding little water.